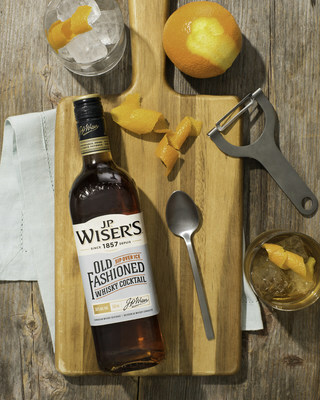 TORONTO, July 9, 2018 /CNW/ - Corby Spirit and Wine is thrilled to introduce an exciting new product just in time for summer: J.P. Wiser's Old Fashioned Whisky Cocktail. This product aims to bring the experience of the classic whisky cocktail from behind the bar to more convenient occasions at home. "With the help of Canadian bartenders, we sought out the perfect Old Fashioned," says Dr. Don Livermore, Master Blender. "While an Old Fashioned seems like a simple cocktail with basic ingredients, it can also be tricky to match the right whisky with simple syrup, sweet orange, and bitters. With the J.P. Wiser's Old Fashioned, we were determined to match all the ingredients in the right proportion." According to Google Trends1 and Drinks International2, the Old Fashioned is the World's Best-Selling Classic Cocktail for the fourth straight year and the #1 searched whisky cocktail on Google over the past twelve months. "Our research shows that more Canadians are wanting to experience the Old Fashioned beyond the traditional bar setting," says Sam Jacobs, Canadian Whisky Brand Manager, Corby Spirit and Wine. "We believe we're changing the cocktail game by providing an easy solution for consumers to make consistent classic cocktails at home for friends and family."